Top Five Advisor is a reviews, technology, WordPress guides and business to business website that focuses on writing in-depth reviews of popular and unknown Internet services, software and much more. In addition to our reviews, we’re focusing on writing content that will help our readers find answers to problems they face in the business world and other categories as well. 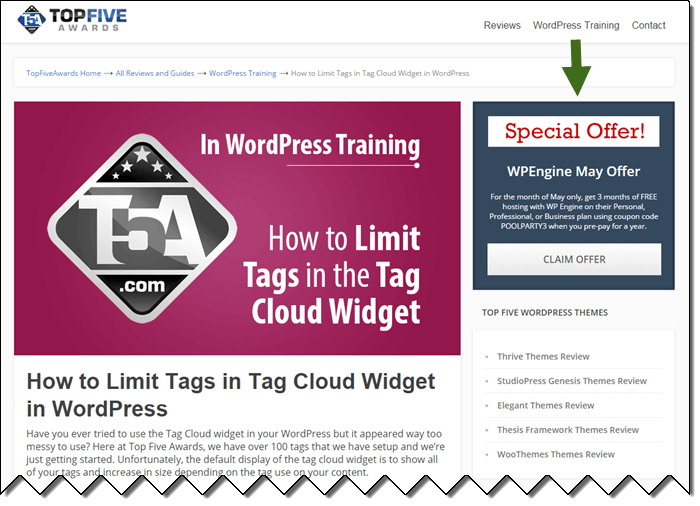 In this particular case, WP Engine sent us a special offer to promote. Since this is a web host that specializes in WordPress-only hosting, we set up this campaign to target the entire WordPress Training section including all WordPress topic sections. This special offer will only appear in those specific areas of the site and because of this, only is seen by those interested in WordPress. We are able to target your advertisements in the right sidebar with site wide, category, topic, specific posts and specific pages specifications. If you have a business product of any kind and you want us to review it, we are very interested in hearing from you. Even if you do not see your direct competitors listed and it is in a niche that we haven’t covered yet, please make the suggestion for consideration at the bottom of this page. Your service or product niche (target category). Affiliate program details (if any). Are you willing to provide us with free access for our review? Case Study: We frequently attend affiliate marketing and business conferences. During an Affiliate Summit event, we were approached by WP Engine and VyprVPN and had private meetings. WP Engine now has massive exposure on Top Five Advisor and we introduced a brand new VPN topic for our VyprVPN review. Make Your Request: If you’d like to talk to the site owner, Scott Buehler, simply provide your phone number and the best time to call. He will make every effort to hear your proposal. In the interest of maintaining a positive reader experience, we are not interested in having tons of banner advertising splattered throughout the website. At this time, we are only allowing a maximum of 2 medium rectangle (300 x 250) advertisements on the right sidebar on any page. Advertising Policy Change: Our policies for advertisers has changed effective May 7th, 2015.